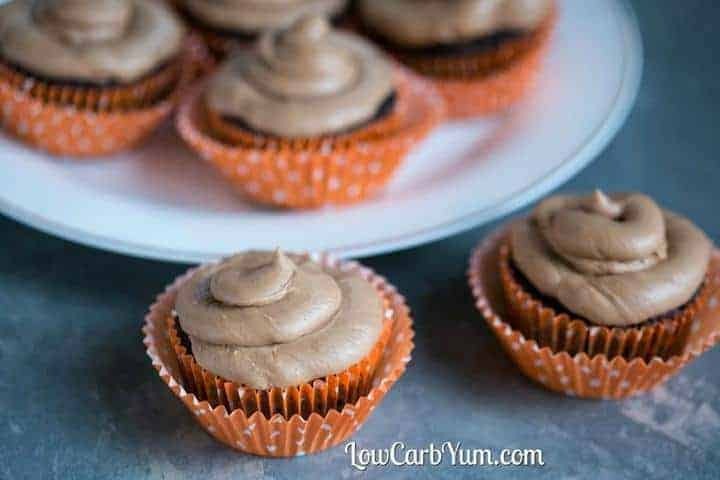 Deliciously moist low carb chocolate cupcakes with a sugar free Nutella frosting. Made with gluten-free coconut flour, a secret ingredient makes them moist. I’ve been having some cake cravings lately. I think I just browse to many yummy recipes on Pinterest and probably saw a few to many tasty cakes. It’s tough for me to resist eating more cake than I should so I scaled these down to cupcakes. I used my German Chocolate Zucchini Cake recipe as a base for these cupcakes. It’s the best chocolate cake recipe I have, but it’s often passed up by those who don’t care for the pecan frosting. 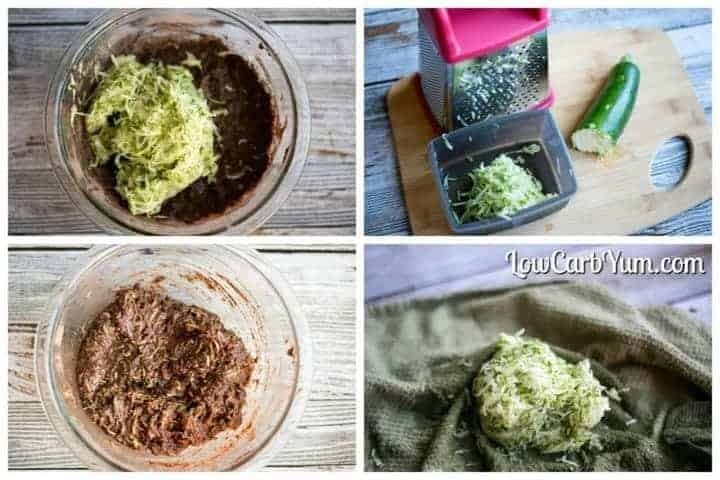 Finely grated zucchini is the secret to making these low carb chocolate cupcakes super moist. And the addition of Nutella frosting really makes them extra special. If you use just coconut flour, the cake can tend to be a little dry. But, using shredded and drained zucchini ensures you’ll get a moist cake every time. For the frosting, I used a 100% natural sugar free hazelnut chocolate spread called Nutilight. If you aren’t watching sugar intake, regular Nutella could be used instead. 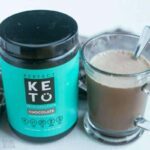 I received a jar in my March 2016 Keto Krate box. 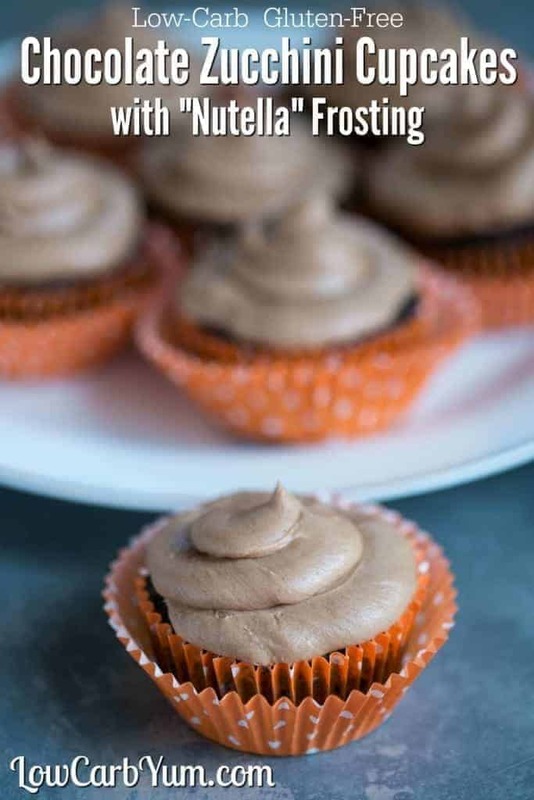 For those that don’t like hazelnut or have a nut allergy, you can just top the cupcake with a plain chocolate buttercream frosting. 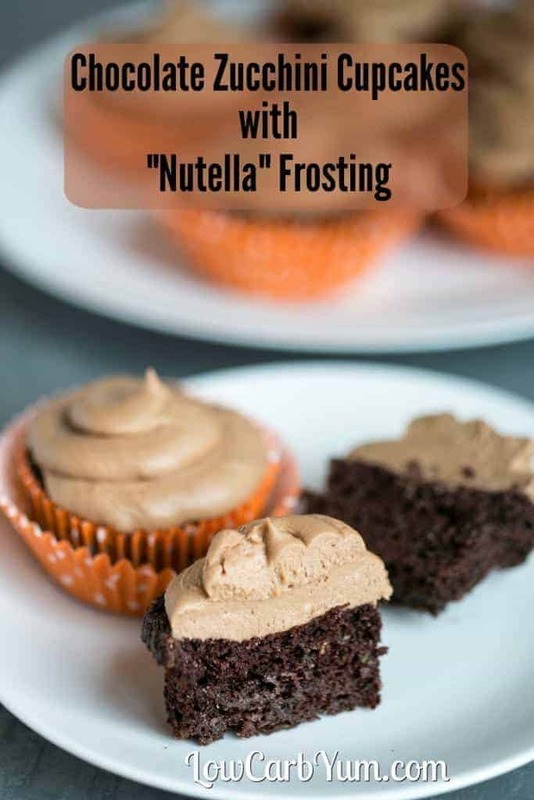 However, I’m loving the added hazelnut flavor that the Nutella frosting adds. Of course, if you are cutting back on sweets, no frosting is always and option too. 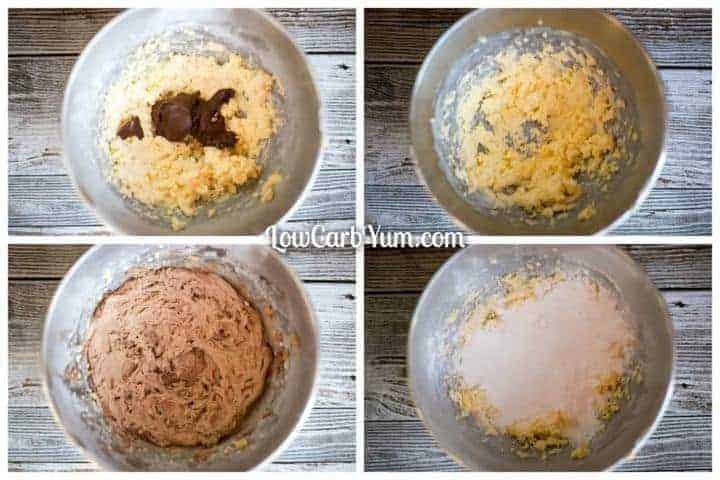 You’ll get about 8 cupcakes from the recipe. To bake a one layer cake, you’d need to double the recipe. For a two layer cake, the recipe would need to be tripled or quadrupled. I used the fine grate side of my box grater to get the zucchini shredded into tiny pieces. I used a whole medium sized zucchini. 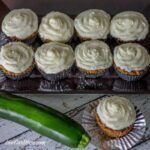 It’s grated so fine that no one will even know there’s zucchini in the chocolate cupcakes. 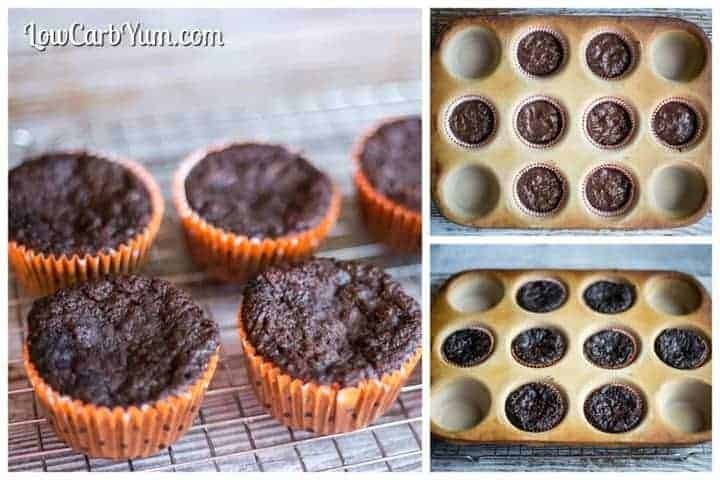 I usually don’t bother using cupcake liners because I have a stoneware muffin pan that has been seasoned. However, I had some cute cupcake papers in the pantry so I decided to use them. For me, buttercream is the only frosting to put on a cake. Whipped cream based frostings are okay, but using a butter base has much more flavor. Adding the hazelnut spread adds a nice touch. 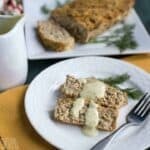 If you don’t have the hazelnut spread, you could make your own or just sub in cocoa and a sweetened flavored syrup or a couple drops of a flavored stevia concentrate. You could probably even use peanut or almond butter instead. 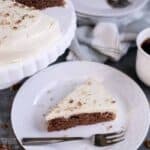 I guarantee this is one of the best, if not the best low carb chocolate cake you will ever try. 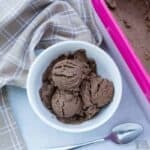 It’s nut-free and dairy-free so it can be served to those with these common allergies. 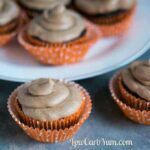 These low carb chocolate cupcakes are so good, your kids will never know they have a veggie snuck in. And, they are way healthier than the sugar loaded cupcakes most kids eat these days. 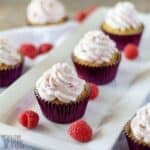 I know my family of non-lowcarbers would never know these are low carb cupcakes. They are perfect for diabetics, too. 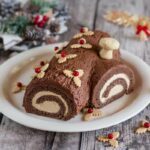 Most of the sugar-free cake mixes marketed towards diabetics are loaded with food additives and artificial ingredients. 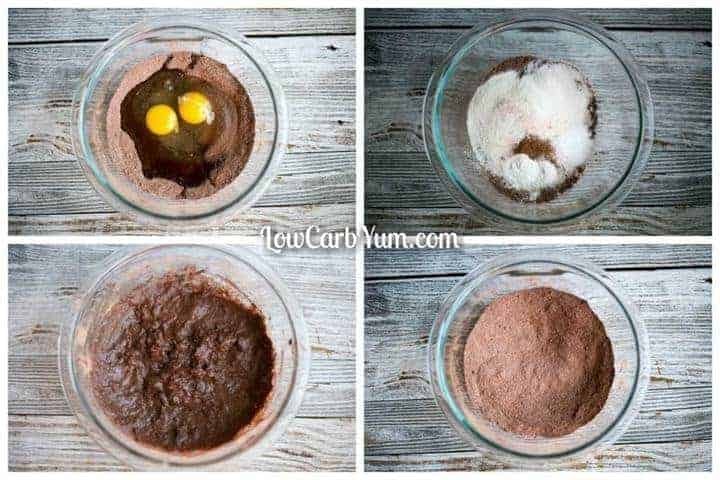 Not these tasty low carb chocolate cupcakes! These yummy gluten free chocolate cupcakes with hazelnut chocolate frosting did not last long in my house. I’m glad I only got eight cupcakes out of the recipe so I didn’t over indulge! I still have a lot of the Nutilight spread left in the jar so I’ll have to find more recipes to use it in. I suppose I could just eat it plain out of the jar on spread on a slice of Soul Bread! 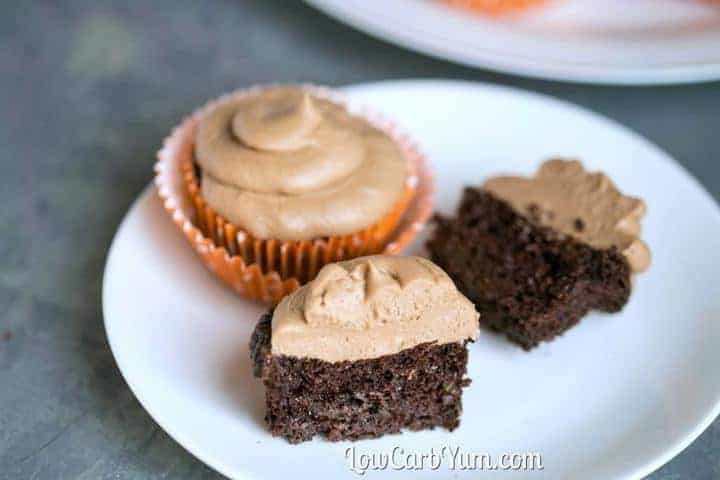 Deliciously moist chocolate cupcakes with a sugar free frosting. Made with gluten-free coconut flour, a secret ingredient makes them moist. Stir together coconut flour, cocoa, sweetener, cinnamon, baking soda, baking powder, and salt. Mix in eggs, coconut oil, and vailla extract until well blended. Stir in grated zucchini. Divide batter between 8 cupcake mold lined or greased. Bake at 350°F for 25-30 minutes or until toothpick inserted in center of cupcake comes out clean. Beat butter and cream cheese with an electric mixer until smooth and creamy. Gradually beat in the powdered sweetener until well mixed in. Add the hazelnut chocolate spread and beat in. Mix in the heavy cream, vanilla extract and salt and beat to fluffy. Frosting could be reduced to half as there was a lot for the number of cupcakes. 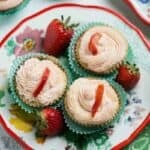 Could you provide nutritional info for the cupcakes without the frosting? Thanks! It’s the same as my chocolate cake recipe. I noticed you use zucchinni in a lot of your cake recipes. Is this so the cake is moist? Yes. 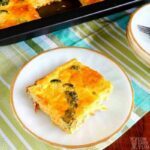 Adding zucchini, especially to coconut flour based cakes, really helps keep the cake moist. I found that the cupcakes were still a bit dry even though I baked them at the minimum time required. I squeezed out the excess moisture from the zucchini and I think it removed too much moisture. I don’t recommend doing that. Just leave the zucchini as is. You don’t mention to squeeze out the moisture in your German Chocolate cake and I found it was good and moist. This recipe disappointed me for that reason. Otherwise it’s one I will try again with that slight change in directions. Thanks. You aren’t supposed to remove the moisture from the grated zucchini. That’s a mistake that I’ll fix. 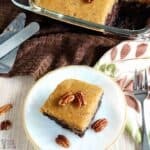 Can I use almond flour instead of coconut? Not in this recipe. There are other changes that would be needed so you’d have to experiment with it to get it right.